It’s not often that I come across amazing recipes that I am dying to share, so when that happens, you know I have a good one!!!! 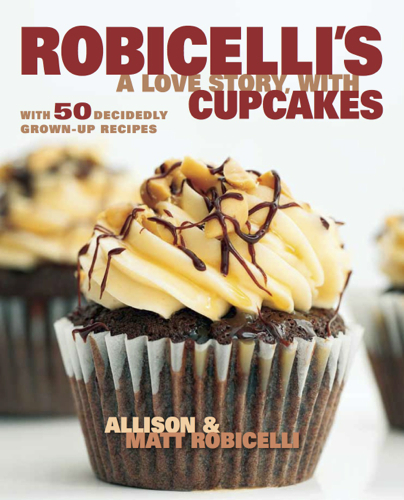 This recipe comes from a brand new cook book that is available for purchase called Robicelli’s : A True Love Story, with Cupcakes by two amazing husband and wife chefs (one being a Chefwife, of course) Allison & Matt Robicelli. They also have an upscale bakery in NY called Robicelli’s and it is going to be the first place I hit when I go to there! This cook book doesn’t have the typical food-coloring, fondant, flower cupcakes. All the recipes are sophisticated, unique and gourmet. If you are a baker or love to bake and want something different, Robicelli’s is the book for you! Seriously, one of the best cook books I own! You have to get yourself a copy!! 1. Peel, core, and finely chop the apples, reserving any juices that come out of them. 3. Remove the lid of the pot, give the mixture a good stir, then set to high and continue to cook for another 3 hours to allow the excess moisture to evaporate and the flavors to concentrate. If for any reason the apple butter gets too thick, add more apple cider, ¼ cup at a time, until the desired consistency is reached. *If you want to do this before you go to bed, that would be smart—you’ll be using your time wisely, and wake up to a house that smells amazing. 2. Line cupcake pans with 24 baking cups. 3. In a stand mixer with the paddle attachment, combine the apples, granulated sugar, and brown sugar and mix on medium-low until well combined, about 1 minute. 4. With the mixer running, slowly pour in the maple syrup, oil, and eggs. Continue mixing until combined. 5. Stop the mixer, remove the bowl and paddle, and use the paddle to scrape the insides of the bowl, making sure everything is fully incorporated. 6. Sift together the flour, baking powder, baking soda, salt, cinnamon, cardamom, and nutmeg, and add to the batter. 7. Mix on medium until just combined, then add the eggs, and continue mixing until the batter is smooth, about 10 to 20 seconds. 8. Remove the bowl and paddle from the mixer and use the paddle to scrape the bottom and sides of the bowl, ensuring that everything is well mixed. 9. Scoop the batter into the prepared baking cups, filling them three quarters of the way. 10. Bake in the middle of the oven for 20 to 25 minutes, rotating the pan halfway through. The cupcakes are done when the centers spring back when you touch them. 11. Remove the cupcakes from the oven and let cool completely while you make the oat crisp and buttercream. 1. Increase the oven temperature to 375° F. Line a baking sheet with parchment paper or a nonstick baking mat. 2. In the mixer with the paddle attachment, cream the butter, oats, brown sugar, and salt on high speed until well mixed. 3. Drizzle in the maple syrup. 4. Turn the mixer to low and add the flour, a bit at a time, until the mixture is crumbly. 5. Crumble the oat crisp loosely across the baking sheet, letting the mixture fall through your fingers in small clumps. 6. Bake for 5 minutes, remove the pan, stir the crisp to redistribute, then bake for another 5 minutes, or until golden brown. 7. Cool completely before using. 2. Put the pot on high heat. It’s going to be there for a while. Be patient and keep your eye on it. Don’t go walking away & watching TV or something. 3. Put yolks & eggs in a stand mixer with the whisk attachment & turn to high. (WEEE!!!) Just let it go! Eggs will triple in volume & go to “ribbons stage.” You can’t overwhip! 4. Wait on the sugar-looking for 235 degrees, aka “soft ball.” When it happens, be ready to move quickly. Turn off the mixer & add xanthan gum, turn to medium. Remove the thermometer from hot sugar. Lift with two hands. 5. Rest the lip of the saucepan on the edge of the mixer bowl. Slowly tilt & pour sugar in a sloooow steady stream down the side of the bowl. Don’t go too fast! If you do there will be chunks of scrambled eggs in your buttercream. 6. Once sugar is all in, turn the mixer to high. (WEEE!!! [AGAIN!]) Beat til cool. Gauge this by putting the inside of your wrist to the outside of the bowl. It’s more accurate than your hands. 7. Switch out the whisk for the paddle. Next we’re adding the butter. It’s too heavy for the whisk and you’ll end up breaking your stand mixer if you stay with the whisk. 8. Start cutting the butter into thin pieces-you could shave it with a cheese slicer if you’d like. Add butter piece by piece-pain in the derriere, yes, but we’re making an emulsion. 9. See, if you dump all the butter in at once, the butter & eggs will never combine properly, & you’ll have a “broken” buttercream. You’ll be able to identify this easily-it’ll be a chunky, watery, hot mess. 10. If your buttercream does break, you can fix it! Turn to medium-high, then add a little more butter, piece by piece, til fixed. Or try adding a little guar gum! This is very strong, so add a pinch & beat for a minute, then check. 11. Once your butter is added, turn the mixer to med/high to add some air-ten, twenty seconds at most. Quelle Magnifique! It should be fluffy & make you want to eat it with your fingers. 12. Once you have your base, there’s so many ways to flavor it! Coffee powder! Vanilla beans! Dutch cocoa! Peanut butter! Caramel! Ham! *Ok, maybe not ham. Party pooper. Now for the Grand Finale!! 1. 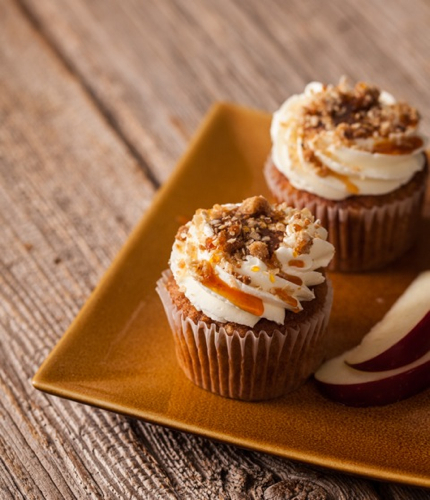 Fill a pastry bag fitted with a fluted tip with the vanilla buttercream and pipe onto each apple cupcake. 2. 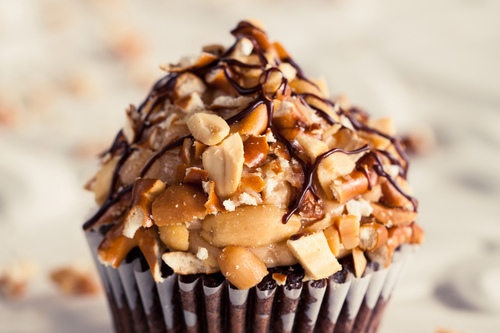 Using the back of a teaspoon, make a small divot in the center of each cupcake, about 1 inch wide. 3. Fill with a generous scoop of the cooled apple butter. 4. Sprinkle the oat crisp across the top of each cupcake. Serve immediately or refrigerate until 10 to 30 minutes before serving. 5. 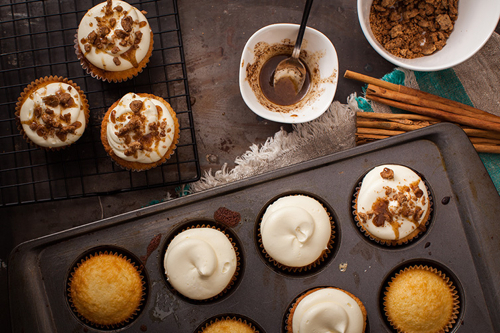 Before serving, drizzle each cupcake with a small amount of maple syrup. **If you don’t feel like making the apple butter or crisp, just use store-bought apple butter and replace the oat crisp with crushed granola.